Prepare muffin pans with liners. Using an ice cream scoop, divide batter evenly among muffin cups. Bake according to the cake mix box directions. Place cereal and Oreo™ cookie pieces into a large plastic bag that can be sealed. Using a rolling pin, crush the ingredients until they are finely ground. You need it to be pretty ground up or else it will make the frosting too chunky. Set crumbs aside for now. While cupcakes are cooling, prepare frosting. Beat butter for a few minutes on medium speed in a mixer with the paddle attachment. Increase mixer speed to medium and add vanilla extract, salt, and 2 tablespoons of milk, and beat for 3 minutes. If your frosting needs a more stiff consistency, add remaining sugar. If your frosting needs to be thinned out, add remaining milk, 1 tablespoons at a time. Add crushed cookie and cereal mix to the frosting and beat until fully incorporated. Place frosting into a piping bag (or spread on with a knife). Frost all cupcakes. 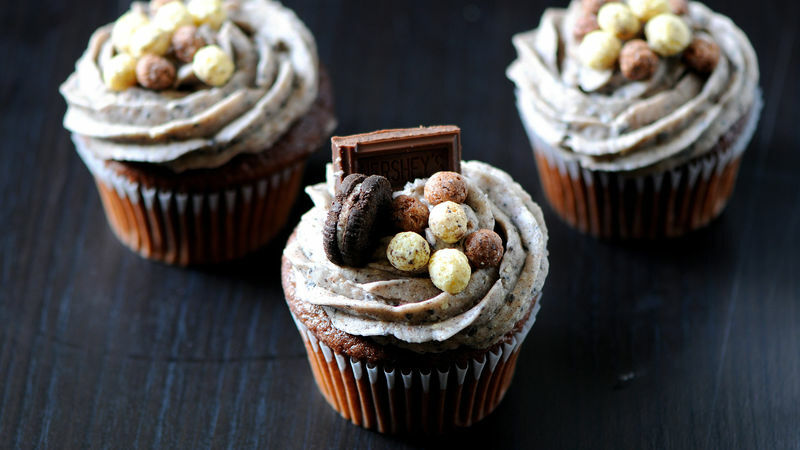 Decorate cupcakes with extra cereal, mini Oreo™ cookies and Hershey's™ chocolate pieces. Hershey's Cookies 'n' Creme cereal finds its way into this yummy frosting, piled high on decadent chocolate cupcakes. Ooo-la-la! If you are like me, you love any chance to get a little dessert into your breakfast. Enter Hersey’s Cookies 'n' Creme Cereal. While it’s amazing in a bowl with milk, I decided it would also make a great cupcake frosting! So with the help of a Betty Crocker™ Super Moist™ cake mix, I introduce to you these yummy Cookies and Cream Cupcakes. You’ll wanna have plenty of milk around when you serve ‘em up! Prepare muffin pans by lining with cupcake liners. Using an ice cream scoop, divide batter evenly among muffin cups. Bake according to the cake mix box directions. Place cereal and chocolate sandwich cookie pieces into a large plastic bag that can be sealed. Using a rolling pin, crush the ingredients until they are finely ground. You need it to be pretty ground up or else it will make the frosting too chunky. While cupcakes are cooling, prepare frosting. If your frosting needs a more stiff consistency, add remaining sugar. If your frosting needs to be thinned out, add remaining milk 1 tablespoon at a time. Add crushed cookie and cereal mix to the frosting. Place frosting into a piping bag and frost cupcakes (or spread on with a knife). Decorate cupcakes with extra cereal, mini chocolate sandwich cookies, and Hersey's chocolate squares. Then get out the milk and enjoy! Is cookies and cream flavor your thing? Then you're gonna love this: Betty Crocker and the Hershey company have teamed up to bring you Betty Crocker Hershey's Cookies 'n Creme cake mix and frosting mix. Believe it -- it's real!